A new roof or new siding for your home or office is a major purchase and investment in your property. Great Canadian Roofing & Siding backs our technicians’ superb workmanship with a 5-year warranty on roofing installations and a 1-year warranty on siding installations. Our warranties give you peace of mind in knowing that your roof and siding will protect your home in the harsh conditions of the Canadian prairies. 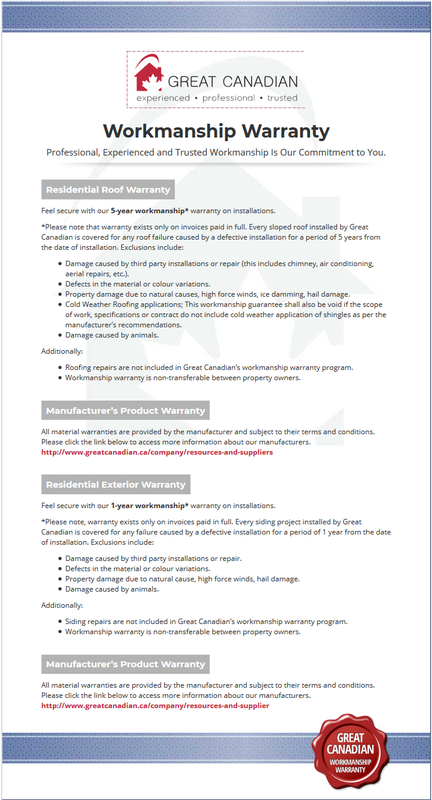 Read our warranty below and give us a call to schedule your installation.